Today we said goodbye to our wonderful, kind neighbor, Elaine B., who passed away suddenly on Christmas day after suffering a devastating stroke on Christmas Eve. We are in shock. Her family, friends and the neighbors on our street are reeling from the sudden loss of Elaine. There is much talk of "if I knew that would be the the last time I saw her/spoke with her...," and much remembering of her sparkly personality and kindness to all. Sometimes it seems like we are so focused on those who are chronically ill or whose health is in decline due to advanced age or a lingering medical condition that we forget others can be "snatched" from us without notice. We are all so sad...the street will not be the same without her. RIP, Elaine. You will be missed. Of course, you are probably expecting a Christmas update from the Bakers...? Here it is! First of all, it was wonderful to be off for 10 days starting last Tuesday. On Tuesday evening we hosted NAGAP friends Dave and Leo who were up from Florida visiting friends who live in Rochester, and that was delightful with delicious desserts from Pittsford Dairy (another indication that is going to be tough eating week (month) for my calories). A visit from them kicked the holiday off right. Also that night we played host to the sweet kitten my coworker Tonya was giving her family on Christmas day. What fun that was! He was so sweet, and we think Jasper really liked having him around...he was very curious and gentle. He's now happily settled into his new home with the new name of "Nicky" - I'm thinking that might be short for St. Nicolas? Hurray! Vacation time is here. The year is wrapping up, and while I may need to do a little work over the break, I'm (mostly) free from the commitments of the working world, at least for a little while! The new year is just around the corner, and sometimes I wonder how I will get everything done in time to wrap up the "old year." Things are super crazy at work and I have some major things to accomplish by Christmas break (since I will also be out for the first three weeks [or so] of January for my surgery), there is still a little shopping to be done, and, of course, I need to fit in a nap or two on the weekends! I also need to finish my bookclub book by January 5 (My Antonia - slow going). 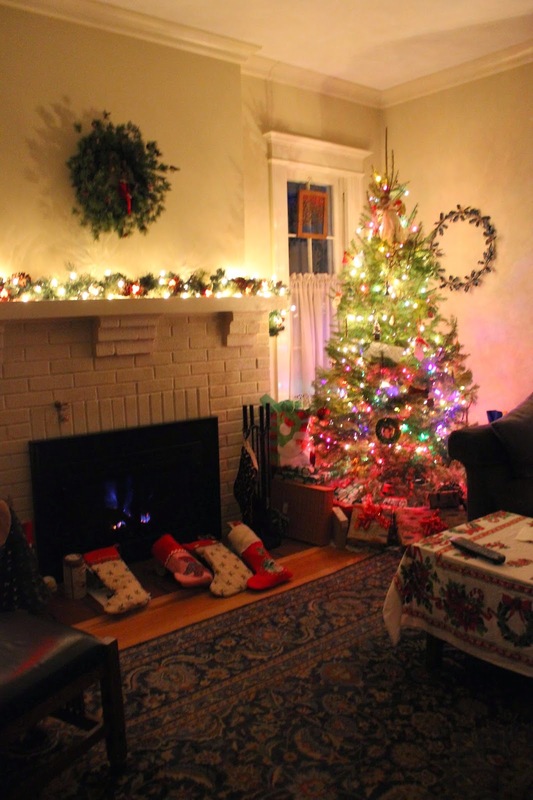 Although I complain about Christmas, it's probably more about how quickly the years are passing (and all the work that comes with decorating and un-decorating the house), and the expense of it all. Ironically, that's also what I love about Christmas. Go figure. WOMEN! We broke with tradition a little and bought a tree from the Boy Scouts this year. Yesterday, was so cold, dark and rainy that I was not in the mood to tromp through icy mud to find a tree, and be chilled to the bone for the rest of the day. So, since my window of "getting all this done" is so short we decided to go a couple of blocks to the Village and get a pre-cut. It's pretty nice, but I expect we'll have more need dropping since it was probably cut a while ago.